You know an activity is catching on when the Wall Street Journal writes about it. Especially a winter activity that is practiced nowhere near Wall St. 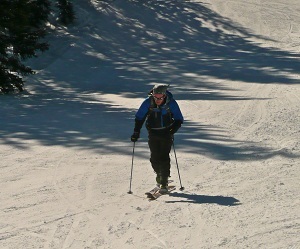 Specifically I am talking about skinning uphill at a ski resort, in most cases with the intention of skiing back down. Indeed, anecdotal evidence would support the case that the activity is seeing rising participation numbers. I know I certainly engage in it more now than I did while frequenting the Downer some 20-odd years ago. As with probably everyone else at that upside down resort (you ski down first, then take the lift back up), the idea never even crossed my mind back then. What a shame, since, as many people are now realizing, the benefits are numerous. Some compare it favorably to winter running, thinking of it as exercise with a reward. Some see it as perfect training for racing or other backcountry pursuits. Others simply call it fun. Of course, as can be expected with any new human behavior, there are going to be some people who frown on the activity. Aside from various heckles you might receive, such as the always insightful "you're going the wrong way", you might be simply told to leave. Some skiers have even been called trespassers. This reaction is not necessarily kneejerk. From the point of view of a ski resort, it's questionable what value uphill skiing offers to them. Uphillers don't need to pay for the use of lifts, yet add to a resort's liability woes if there happens to be a collision or other accident involving them. It is understandable that some resorts have decided to ban the activity altogether. Forward thinking resorts, however, are taking an early lead in establishing welcoming uphill policies. Some allow uphillers anytime for free, hoping they will bring enthusiasm and spend money on post-workout food and drink. Others might charge a small fee or limit the activity to certain runs or hours. A few will even ask for customer feedback as they consider how to adapt to changing skier habits. We believe most resorts will end up being fairly accommodative to uphillers, just as they've done in the past to other "outlaw" groups such as snowboarders. A much bigger problem with the activity in our view is the name. Or more accurately, the lack of one. By my count I've used the generic word "activity" eight times so far in this article, counting this sentence. The problem is not my diction. My nondescript word count would certainly be lower if I wrote an article on ski racing or some other clearly defined sport. The authors I've referenced above have had an equally hard time referring to the topic. They use such monikers as "uphill skiing", "fitness skinning", "fitness skiing", and my personal favorite, "stairmaster with a view". Around these parts, we've taken to calling it Resort Uphilling. Uphill skiing is contradictory, since skiing is what you do on the way down. Using the word fitness unecessarily limits the concept to only one possible reason for doing it. And I believe the word StairMaster is trademarked, so let's not go there. Resort uphilling is descriptive, non-restrictive, and easily differentiated from "ski touring", "ski mountaineering" or "backcountry skiing". Those terms imply that you are (often far) outside the friendly confines of a ski resort. Resort uphillers, on the other hand, will likely be mixing it up with traditional alpine skiers, though hopefully at a safe distance. Name aside, we encourage you to give the activity a try if you haven't. You will most certainly find it as rewarding as those who have. As Shakespeare said, "a rose by any other name would smell as sweet". So go out and smell the roses, or in this case, earn your turns. Please remember to check your local ski resort's policy before cruising up their freshly groomed runs. Then abide by it; the last thing a new activity needs is a bad reputation. A good approximation of the policy might be available on this list maintained by the USSMA. If not, please help them out by forwarding what you learn. We think it's only a matter of time before uphill policies become relatively standardized. However, it's only speculation to say that resort uphilling will become a mainstream activity in the future. Look to the Wall Street Journal to keep you apprised. As a snowboarder, I know I must have an open mind, if for no other reason than to acknowledge the progress my sport has been afforded over the decades. I have to say, though, that I can see a distinct safety risk presented by the uphilling. General ski resort safety dictates you ride/ski in a controlled, safe manner. Going "against" the grain doesn't strike me as safe, since it's a direction 99.9 percent of skiers/riders will not expect to see a person going. Throw in rollovers, blind curves, and icy conditions, and I can't blame resorts for viewing the practice in a harsh light. It's actually something I've considered doing, so I take no issue with it, other than from a safety perspective. Perhaps resorts could designate certain areas where uphilling is allowed, so that "downhillers" can be aware and take proper precautions. Good analysis Phil. Indeed, resorts such as A Basin allow it on certain runs. Others at certain times of the day. It's definitely a good idea to keep well to the side of the runs and to avoid rollovers and other blind spots. Patrollers follow the same guidelines when riding snowmobiles.